These new charges were brought against her after she was re-arrested at the Khartoum airport along with her two children and husband, an American citizen. She is being accused of using her Christian name and not her Islamic name in her documents. She was planning on traveling to the US with her family. Her lawyers maintain her documents were all legitimate. 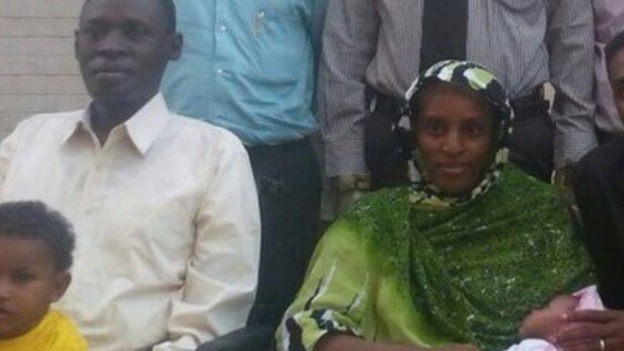 Ibrahim’s husband, Daniel Wani, an American citizen residing in New Hampshire, had said upon his wife’s release from prison that the family intended to travel to the U.S.
Meriam, who had been charged with apostasy, or leaving Islam, was told she should have used her given name on the documents and not the Christian name she adopted after becoming a Christian, according to sources. At the airport in Khartoum, 40 members of Sudan’s security police confronted Meriam and her family, taking them in for questioning. ‘The State Department is engaging directly with Sudanese officials to secure their safe and swift departure from Sudan,’ Harf said. Sudan is in the hands of men with very small minds. They are like ill behaved children. They are in need of a major beat down. It just kills them that anyone would not want to follow their petty, narrow-minded, intolerant religion from the seventh century. The thing that is necessary is to help the Sudanese to see the error of their thinking, through kind words and an attitude of forgiveness. These are people who do not understand that they would be more respected if they just did the right thing, which would be to release the American citizen, Daniel Wani, his wife, and children.